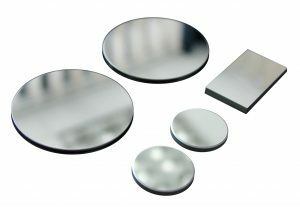 Calex can supply protective windows for pyrometers, and IR-transmissive viewport windows. This brief summary aims to help you to choose a suitable window. Protective windows, such as PWS and PWL, are ideal for use in the food and pharmaceutical industries. They protect the lens of Calex infrared temperature sensors by preventing contamination and/or mechanical damage. In addition, should a lens become damaged, they can retain fragments of the broken lens. These windows are made from silicon or plastic, and are for use at atmospheric pressure. To use the windows, mount the sensor using the mounting nut as normal ensuring sufficient thread is available for the window holder. Simply screw the window holder onto the front of the sensor and tighten with a spanner. Ensure the window is kept clean and dry. If there is dust, condensation or ice on the window, the accuracy of the measurement could be affected. If this is possible in your application, consider using an air purge collar instead, or get in touch and we will discuss the possibilities. With all models of window, the sensor must have its emissivity setting adjusted to compensate for the small percentage of infrared energy lost to reflection and absorption by the window. Therefore, these windows are only for use with sensors with adjustable emissivity (such as the PyroMini) and are not suitable for simple sensors with a fixed emissivity setting (such as the PyroCouple). These windows protect the sensor from chemical damage, high pressure, high temperature or a vacuum, and are designed to be mounted in a flange on your process. They are inexpensive compared to the cost of replacing the lens of the sensor. Viewport windows come in a choice of materials to suit a range of sensors and applications. They are commonly circular, however other shapes are available. 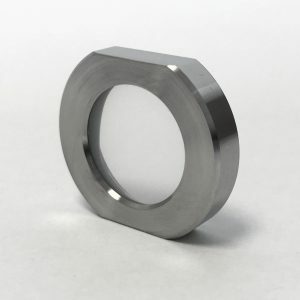 There is a wide range of standard sizes, or they can be custom-made to suit your requirements. If you would like to find out more about using a protective window or infrared viewport with a Calex pyrometer, please contact our engineers.